I'll be the first to admit: I'm a wimp when it comes to scary things. Horror films freak me out, I refuse to read anything by Stephen King, and I've been to exactly one haunted house in my life, which was more than enough for me. But at the same time, it is really fun to get in the Halloween mood and enjoy being scared a little bit during this spooky time of year. Emphasis on a little bit ;) I don't always have time to commit to a big Halloween novel in October, but I love short stories. They're fun, and scary, but you can read them quickly and you won't have to sleep with the light on for weeks afterwards. I haven't actually read the novel version of this story, but I read a shortened graphic novel. It was the perfect blend of scary and short, even though the illustrations were a little distracting in my opinion. I like the cartoon version of this one, too :) It's about a superstitious man who takes an ill-fated trip into the woods. I remember reading this in middle school before Halloween. Edgar Allan Poe is the master of horror short stories, and this one was perfectly sinister. It's about a single-minded man with a terrible plan for revenge. This is a collection of very short scary stories. 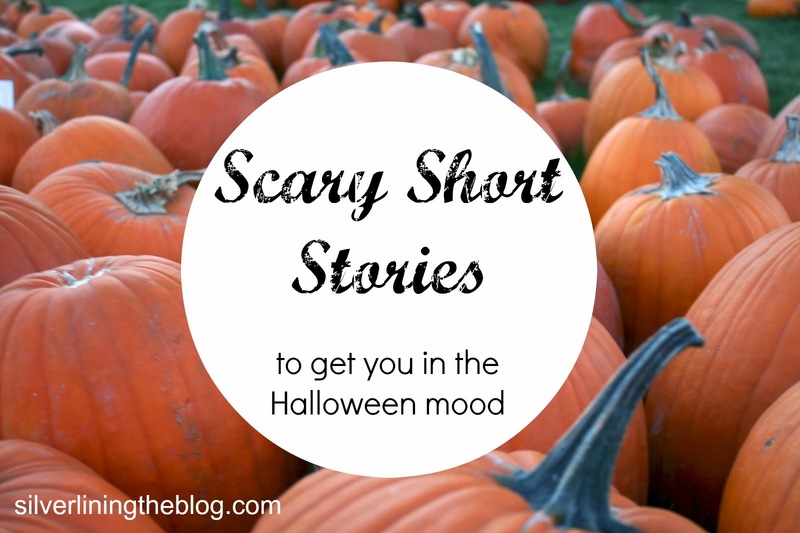 Some of these are scarier than others, but overall, this is a good collection of horror stories. As the title suggests, these are best read aloud in a dark room. The illustrations are creepy too. Another perfectly scary short story about a paranoid murderer trying to prove his innocence. They just don't make stories nowadays like they used to. This is one of the classics. This is an illustrated children's book about an older man who lives alone and cuts off the tail of an animal to eat for dinner. But then the animal wants its tail back... This one is good for younger audiences, too. The Raven is a short poem by the classic Poe. This is probably one of the most iconic Halloween stories of all time. It's not my personal favorite of his, but hey, you can't make a list of scary short stories without including The Raven. The Ghost-Eye Tree - Bill Martin Jr. This book is beautifully written and illustrated. It's really not too scary, and actually has a good message to it, but it had to be included here because it gets the reader instantly in a spooky Halloween mood. It's about two young kids who have to pass by a haunted tree on a dark night. A great read-aloud to kids. In case you do have time for a novel, I'd recommend Frankenstein, Dracula, Dr. Jekyll and Mr. Hyde, and The Phantom of the Opera. However, these books aren't the action-packed thrillers I thought they would be. For example, Dracula is 90% about the scientific process and only 10% about vampires. And Frankenstein is just weird and disjointed, which I think is supposed to be the point, but still, I ended up skimming most of it.The shortened versions of these stories would be fun though. If you don't totally love being freaked out, this next list is for you. It's a list of novels that aren't horror stories (in fact, most of these are romances), but they still have a wonderful stormy, unsettled feeling about them. I love cuddling up with one of these books on a spooky, windy night. Which of these do you love/hate? And what am I missing? Tell me your favorite spooky short stories! I tend to do a Horror Short Story unit in October for my junior high students: "The Tell-Tale Heart", "The Most Dangerous Game," and "The Monkey's Paw"
I forgot about the most dangerous game!! I just added that one to my list. Ah, it's such a creepy one. I love it. Thank you for helping me remember that one! Ooooh I love this post! I'm always looking for ways to get in the mood for Halloween, and this is perfect. Also these pictures?! Heart eyes! The Ghost-Eye Tree sounds pretty interesting. The Night Circus is one of my favourite books, I actually picked it up to reread just a few days ago. I thought autumn to be the perfect time to delve in to it again. I love it too! I don't reread books very often, but that one is definitely on my re-read list. Such a great book.